I enjoy watching the hummingbirds and so did my cat. Except, my cat watched them for a different reason. One day she “gifted” me with a hummingbird. Of course, when I saw the little bird laying on the living room floor, deader than a doornail stiff, I shrieked. My cat was very proud of the gift she had given me. I was horrified. They are sweet little birds that shouldn’t be on my cat’s menu. Sassy was a well fed cat and didn’t need to kill birds to eat. Therefore, she got no pity from me. Picking up the little body, I wrapped it very carefully in paper towels and gave her a quick funeral in the trash can. I walked off to do something else and my conscience told me to go get that little bird and bury her outside. I turned around and went and took her out of the trash. Wait… What? Why is this little bird moving? Dead birds don’t move. I quickly unwrapped her from the paper towels and discovered she was alive! She had only been in shock. After inspecting her and confirming there were no wounds on her, I took her outside and sat her on the patio table hoping she would fly away. She tried, but her little wings couldn’t take flight. I determined she must have a broken or bruised wing. I set up housekeeping for my little bird, in a box with a hummingbird feeder. To keep her safe from a certain death, I kept her locked in my bathroom for a few days. I bought her a bird cage and put her in the area where I am most of the time, the kitchen. My cat wasn’t too happy about her “gift” being in a cage on top of the freezer, but she dealt with it. One day I tried covering her cage thinking that might be calming to her. She threw a fit. So, I took it off. I named her Flower, and she would cling to my finger as I lifted her out of her cage to kiss the top of her tiny head. Every few days I would set her on the patio table to see if she would fly, but to no advail. Thanks to the Humane Society, a couple was found that rehabilitates birds and then releases them. Reluctantly, I gave them Flower. Two weeks later the woman called me and told me she found Flower flying around her cage that morning. So, she put her cage on the picnic table, leaving the hatch door open. She said she watched as Flower poked her head out the hatch door but she wouldn’t fly out, until another hummingbird flew into her cage to eat from her feeder. Flower then made her escape to freedom and in just enough time to migrate with the other hummingbirds. Last summer, while I was sitting in front of my large kitchen window a little hummingbird came flying right up to the window, hovering for a few minutes as it watched me, then flew away. I can’t say for sure if that was Flower, but I certainly like to think so. My cat never again gifted me with a hummingbird. But at least I got to save one little bird, and her name was Flower. I was kindly nominated to participate in the Five Days Challenge by snowsfissuresandfractures and was asked to post five photos, one per day for five days, and write five stories, one for each day. Today is day 5. Today, I choose JR, author of the blog, Nuggets of Gold. I am asking you to post a photo every day for five days and write a story to go along with each photo. This story can be fiction or non-fiction and can be from a short paragraph to a page. Next, please select one person each day to carry on this challenge. This challenge is not mandatory and can be refused. (However, I hope you will agree to participate and to join the fun). This is my last day of the challenge and I wish to tell snowsfissuresandfractures thank you for this opportunity. I would also like to thank all of you who have so graciously accepted this challenge. Oh dear! You’re right! It is NOT fiction. I tagged it wrong. Thanks Colleen! I was tagging it at 3:00 am this morning! LOL. I just went in and changed it but I can’t change the email posts. Really? That is really funny! Thank you! It was a “happy feeling” thing to do. I loved the experience. OH this is such a beautiful, tender story! Love it! Thanks for sharing! Hummingbirds are beautiful! Yes, they are. I love hummingbirds. I remember reading it on your blog. You have once told this beautiful story. What a beautiful story, you warmed my heart on this rainy Monday afternoon. Thank you Jodi! I really loved saving that little bird and I love her too. Oh what a happy story, except for the horror poor Flower must have gone through getting captured by a cat. But how amazing that your cat had the wherewithal to not kill the tiny bird! Well, she didn’t save anymore after that. She ate them. Broke my heart, but she was a cat. A year ago last October my cat went missing. I never could find her and I looked everywhere and even put an ad in the paper. I think some people got rid of her. Either that or coyotes or foxes. It broke my heart and still does. I would absolutely love for her to show up Cat. That would at least assure me she wasn’t a meal for a fox or coyote. But I am pretty sure some people got rid of her. more than likely, Joy, but what I hear… what goes around.. they’ll rue the day! I hope for that too. She was like a child to me. People such as me, pretty much, our pets are our children and family. To me, she had special needs and really needed me. I don’t think she would be able to survive somewhere else. Yes they are. My cat couldn’t understand why I wouldn’t kill the gifts she gave me and eat them. Hahaha! Yes, I took the photo of the little hummingbird. I would stand out by the feeders very still and let the birds get use to me being close. Finally, I would stand out there with my camera ready and shoot them. It took a little patience to get that photo. LOL! Well you did a fantastic job!! Your patience paid off big time. You are a great photographer. I do that too with fast moving subjects. I just keep pointing and clicking. I figure sooner or later I will get a decent pic!! That’s pretty much what I had to do with the hummingbirds. I was too Millie. I was so happy she wasn’t wounded badly other than her wing. My cat went missing a year ago last October. I really miss her but I don’t miss her gifts or her killing the birds. 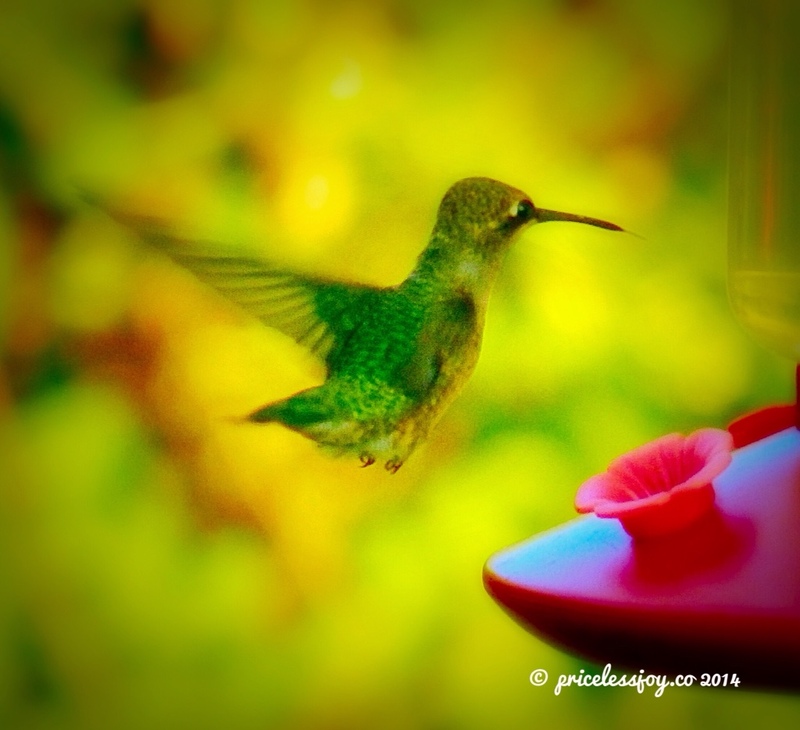 I love watching the hummingbirds. They are so funny to watch. Some birds will get territorial with the feeders and not let another species of hummingbirds eat. Finally that species of hummingbirds will gang up and try eating and run the territorial birds ragged. Finally, they would stop and all eat together. LOL! What a fantastic photograph and just a great story, PJ! I love hummingbirds! This is the time of year we have Anna hummingbirds mating. I’m a little concerned that, since putting up a new feeder last week, I haven’t been seeing very many 😦 I miss seeing them. I’m not sure what Anna Hummingbirds look like. I love watching the birds. They are so funny sometimes. One species of hummingbirds will hog the feeders and run the other birds off. Finally the other species will gang up and run the territorial birds ragged. After a while, they will all be eating at the feeders together. I hope your little birds come back soon. Thank you!! Do you like hummingbirds? I don’t particularly like birds.The gift from your cat with which you were not pleased resonates with me because I have a loving cat that does things that disturb me; but which I think is his way of connecting with me. Your nurturing of the hummingbird is touching. Thank you. My cat did things that really disturbed me too. I was happy about the mice she would catch. I miss my cat. Thank you for accepting the challenge and putting out some awesome posts! I am too! I wish I could have watched her fly to her freedom!